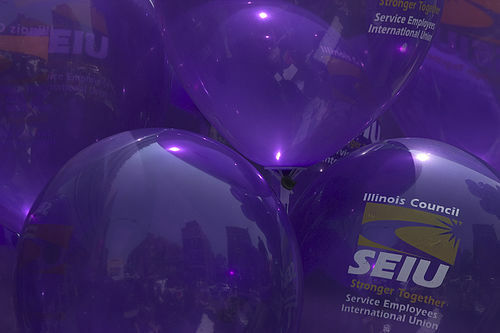 Today, proto-union “worker centers” set up by the SEIU will stage demonstrations in up to 30 cities in support of SEIU’s “Fight for 15” organizing campaign. The demonstrations are part of an ongoing, complex, and sophisticated campaign to organize restaurant employees without a secret ballot under card check arrangements. Today’s protests are expected to focus on allegations of “wage theft,” which is union-speak for underpayment of wages and uncompensated work. Workers referred by the SEIU to or through the lawfirm Cohen Milstein Sellers and Toll—which did $14,574 of business with SEIU in 2012—recently sued McDonald’s and some McDonald’s franchisees alleging these practices. That brought our minds back to a November 2013 report in the labor movement newspaper In These Times on Fast Food Forward. The reporter described SEIU’s strategy in multiple stages. Phase one, which the lawsuit’s inclusion of McDonald’s as corporate parent emphasizes, is waging legal attacks on the distinction between franchisors and franchisees. The reason? Organizing “fissured” industries like restaurants is time consuming, expensive, and doesn’t yield many members-per-effort. Organize a franchise of McDonald’s, get 10-20 members, go to next franchise, start over. Wouldn’t it be easier just to go to a corporate parent, get the parent to agree to card-check on behalf of all franchises, and be done with it? The SEIU thinks so. Targeting (initially) the McDonald’s, Burger King, and Wendy’s brands, the union will push the idea of “wage theft” in brand attacks to intimidate corporate parents into a deal. At the same time, the specter of legal liability for franchisee misdeeds will pressure the brands to the table. SEIU’s endgame? Card check unionization agreements (under the P.R. tested euphemism “neutrality agreements”) with the brands, enforceable against franchisees. The sophistication and depth of SEIU’s multi-pronged and multi-tiered strategy puts employee rights in a bind. Against a bare-knuckle political operation run through the SEIU’s P.R. firm BerlinRosen—which claims credit for getting the sitting Attorney General of New York State (Eric Schneiderman) and New York City Mayor de Blasio elected—on one hand and SEIU’s history of intimidation on the other, it may take a federal solution—like the Employee Rights Act, which would update America’s Truman-vintage labor laws to require secret-ballot unionization elections and periodic union recertification—to ensure that employees’ voices are heard.